Successfully Added Explorer 2C Action Camera - Sony Sensor, 4K Recording, Wide Angle Lens, 2 Inch Touch Screen, Novatek Chipset to your Shopping Cart. 170 degree wide angle lens captures amazing perspectives. 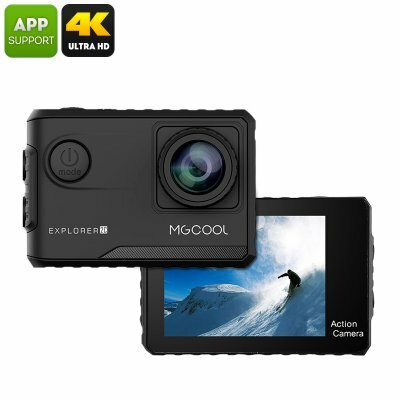 The Explorer 2C action camera from MGCOOL is a great alternative to a GoPro. This 4K action camera renders super sharp images all thanks to the stunning Sony IMX078 sensor and Novatek 96660 chipset. This action camera has a 7G lens that enhances light input and with its 170 degree wide angled lens you get alluring images with a wide color gamut and natural tones. Action camera are typically compact and the Explorer 2C is one of the smallest. With a weight of only 70 grams and measuring 58x40x30mm it is compact and light enough for all your needs. This sports camera has a dedicated power button on the front as well as a single recording button. When it comes to the settings the 2.0 inch responsive touch screen offers simple and easy navigation. When recording 4K video this action camera can capture 24fps and for faster paced action you can record in 1080P at 60fps or even 120fps if you chose a HD recording. You'll be able to enjoy a full range of functions on this sports action camera. With anti-shake, a special diving mode, adjustable exposure and white balance as well as having a recording angle option that all allow you to easily set up shots for almost any condition. Powered by a 1050mAh battery that brings respectable usage times and with Wi-Fi connectivity compatible with Android 4.4 and above you'll find it easy to share photos and videos through your connected devices making it simple to upload to social media and sharing sites. If your looking for a cheap action camera that can shoot 4K video and has all the features you need then the Explore 2C is a great option and comes with 12 months warranty, brought to you by the leader in electronic devices as well as wholesale 4K action cameras..